If you know anything about me, then you know that my obsession with pizza is REAL. 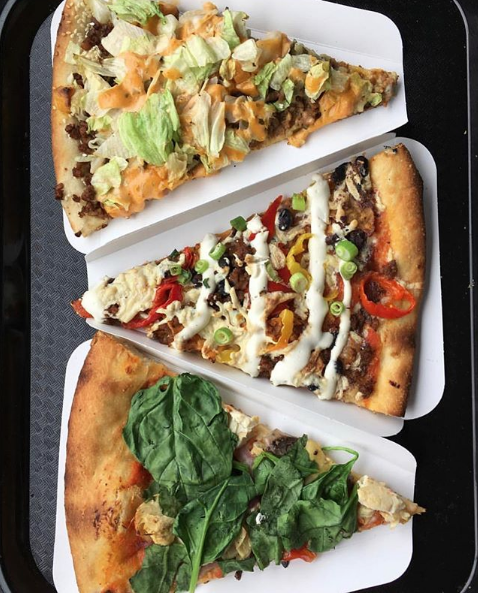 If you like pizza, then you have to try Apiecalypse Now. The staff are edgy and hip, and I feel cooler just by being around them haha. Their pizza's are unbelievable and they have such cool and unique flavours. I'm not the biggest fan of processed vegan cheese, so my absolute favourite is the Reunion Tour since it's topped with their house-made cashew ricotta - guys it's so good. It's made with local organic tomato sauce, savoury marinated mushrooms, garlic artichokes, red onions, sweet cherry tomatoes, fresh baby spinach, house cashew ricotta cheese. Even though I don't order the other types (I'm literally so obsessed with the Reunion Tour that I could order it twice a week for the rest of my life), my husband and friends order the other types so I can tell you what's good! My husband also loves the Pig Destroyer Destroyer, and the Zachos! And if their mind blowing pizza wasn't enough... they're also a bakery!!! Make sure you go early if you want them though, because they sell out! I'm a huge fan of their dunkaroos - THEY'RE SO GOOD!